This sweet and simple 5-ingredient bake is a coconut lover’s dream. 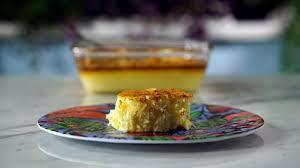 In a bowl, whisk together the condensed milk, eggs, coconut milk and milk. Stir in the grated coconut, then pour into a greased baking dish.